LOS ANGELES (CelebrityAccess) — After several weeks of rumors, The Stones have finally officially announced their plans for a stadium tour of North America in 2015. Promoted by AEG Live’s Concerts West, the Zip Code tour will kick off on May 24 in San Diego and will make stops in Columbus, Minneapolis, Dallas, Atlanta, Orlando, Nashville, Pittsburgh, Milwaukee, Kansas City, Raleigh, Indianapolis, Detroit and Buffalo before wrapping in Quebec on July 15 at Le Festival D’Été de Québec. 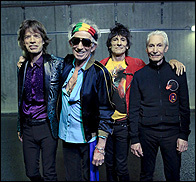 The Zip Code tour will be the Stones first stadium tour of North America since the Bigger Bang tour, which ran from 2005 to 2007. More recently, the band concluded their 14 ON FIRE tour in Asia, Europe, Australia and New Zealand in 2014.